In July 2018, a committee passed the so-called Aderholt Amendment to an appropriations bill that creates a federal license to discriminate for child welfare providers. 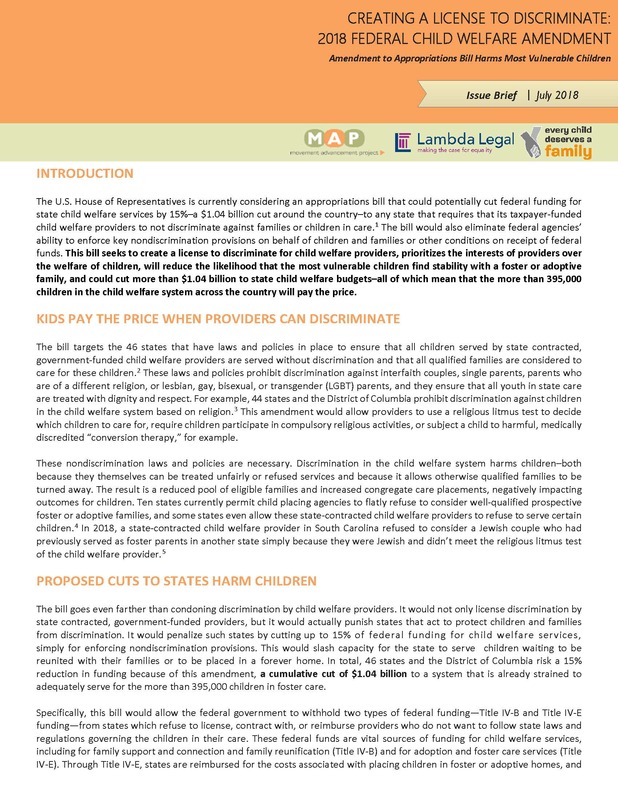 As detailed in a brief released by MAP, Lambda Legal, and the Every Child Deserves a Family coalition, if passed, this bill would harm more than 395,000 children in the child welfare system. First, it would allow agencies to use a religious litmus test to determine which children and families to serve. It would also reduce the pool of qualified foster and adoptive families, resulting in negative outcomes for children in care. Finally, it would penalize states that enforce nondiscrimination laws or policies with a potential cumulative cut of $1.04 billion in child welfare funding to states, leaving these states with even fewer resources to care for the children in their care. Movement Advancement Project, Lambda Legal, and Every Child Deserves a Family Coalition. July 2018. Creating a License to Discriminate: 2018 Federal Child Welfare Amendment. http://www.lgbtmap.org/2018-child-welfare-amendment (date of access).